Trunks: Stems or trunk ascending to erect; branches usually unarmed, sometimes armed, thorns dark gray to black, straight to plus or minus recurved, 1.2 to 2.4 inches; bark reddish brown to yellowish brown, fissures shallow, ridges blocky or scaly, peeling or exfoliating. Twigs: Brown to gray, rigid, initially tomentose, glabrescent; leaf scars crescent-shaped to V-shaped; buds reddish brown, ovoid, .12 to .2 inch, apex acute, scales tomentose. Leaves: Deciduous, alternate, simple; petiole .6 to 1.6 inches, tomentose or glabrate; blade ovate to elliptic, 1.6 to 4 inches long, 1.2 to 3.2 inches wide, thin, base truncate to wedge-shaped, lobes 2-4 per side, margins serrate, veins 4-7(-9) per side, apex acute to obtuse, lower surface light yellowish green, tomentose, upper surface dark yellowish green to green, dull, scabrous-pubescent or glabrate. Flowers: Inflorescences terminal from new growth, cymes, 5-15-flowered; pedicels .4 to .8 inch, tomentose.bisexual, radially symmetric, .8 to 1 inch diameter; hypanthium obconic, tomentose; sepals 5, spreading, triangular, .16 to .24 inch; petals 5, white, elliptic to obovate, .3 to .5 inch; stamens (10 or) 20; anthers white; pistil 1, ovary inferior, (3-)5-locular, partially adnate to hypanthium; styles (3–)5, connate proximally, .28 to .3 inch; stigmas as many as styles, capitate. Fruit: September to October; pomes, red, nearly spherical, .5 to .6 inch diameter, more or less tomentose, more or less glaucous; sepals usually deciduous; stones (3-)5, yellowish brown, wedge-shaped, .2 to .3 × .08 to .16 inch. Habitat: Upland forests, woodland edges, floodplains, fencerows, pastures. 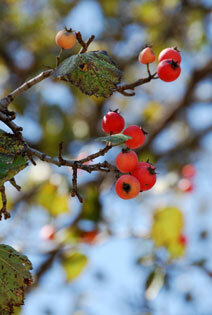 Comments: Crataegus mollis is a common, widespread species in the eastern United States west of the Appalachians.